Akti Aegeou apartments in Tinos island Greece, consisting of studios, apartments and suites with one or two bedrooms, kitchen, shower, telephone (direct-dial), music, A/C, daily maid service, sea view and wireless internet. Swimming pool, restaurant, pool bar, parking. 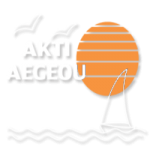 The hotel Akti Aegeou is located in the organized beach of Laouti. Our unit from: the beach: 30m, the bus stop: 200m, the town/the harbour: 6km, the mini market: 150m.